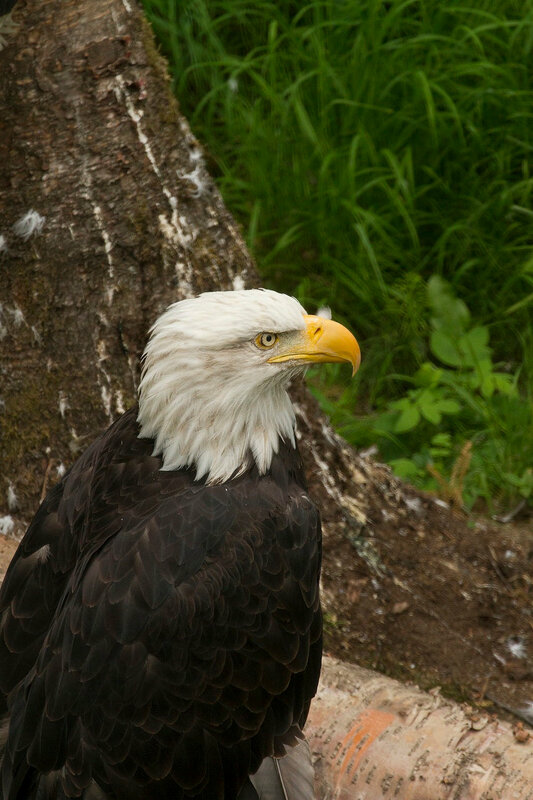 Meet the bald eagle and golden eagle, both native species in Alaska and residents of the Alaska Zoo. Back to animal directory. RANGE: Found only in North America. Common along coasts, offshore islands, and interior lakes and rivers. SIZE: Wing span is up to 7.5 feet and they can weigh up to 14 pounds. As in all raptors, females are larger than males. PHYSICAL FEATURES: Identified by white head and tail feathers when adults. White head plumage not attained until four to five years. Immature bald eagles look very similar to golden eagles. Immature bald eagles lack feathers on their tarsi (lower leg), helping to distinguish them from golden eagles (golden eagles feathered to the foot). FOOD: Fish, primarily salmon. Other food includes waterfowl, small mammals, sea urchins, clams, crabs, and carrion. BEHAVIOR: Nesting begins in early April. Two eggs are laid in spring and hatch from late May to early June. Eagles are fully feathered and ready to leave the nest by August. Eagles mate for life, although mates will be replaced if missing. CONSERVATION: Bald eagles were endangered in the Lower 48 states, but changed to threatened as numbers recovered. They were delisted from the endangered species list in June of 2007 because their numbers had recovered sufficiently. They are still protected under the Migratory Bird Treaty Act and the Bald and Golden Eagle Protection Act. It is illegal to kill or possess any part of an eagle, including feathers (unless permitted by USFWS). They were endangered in the Lower 48 states due to habitat destruction, illegal shooting, electrocution, pesticides and poisoning (all still threats today). In Alaska, nest destruction and degradation of salmon spawning streams by logging can be a significant threat. Alaskan populations have always been considered healthy. RANGE: Golden eagles range throughout northern regions of this hemisphere. In Alaska, golden eagles are found north to the Brooks Range and have a scattered distribution south in the state. There is a well studied population of golden eagles in Denali National Park and surrounding areas. Golden eagles above 55 degrees north latitude are migratory. SIZE: Golden eagles have a 6 to 7 foot wingspan, weighing between 8 and 12 pounds. Females are larger than males, as in other raptor species. PHYSICAL FEATURES: Golden eagles have a lighter “golden” patch offeathers across the neck and head (varies by individual). Juveniles have slightly more white feather coloration, which disappears as they molt feathers over their first several years. Golden eagles are often confused with juvenile bald eagles (bald eagles lack the white head plumage until they are around 5 years old). One key identification feature for golden eagles is the feathering which extends all the way down the leg (bald eagles lack feathers all the way down the leg). FOOD: This eagle species feeds on ground squirrels, hares, other birds and raptors. They can take prey as large as a young Dall sheep, although this is not common. They scavenge from carrion, lifting 4 pounds from the ground (more if they grab in flight). BEHAVIOR: Nests are often located along cliffs. CONSERVATION: Golden eagles have the same protections as bald eagles through the Migratory Bird Treaty Act and the Bald and Golden Eagle Protection Act. It is illegal to kill or possess any part of an eagle, including feathers (unless permitted by USFWS). The biggest impacts to golden eagles in Alaska are human disturbance and loss of habitat in some areas.